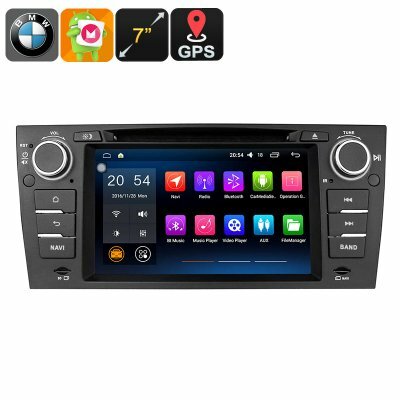 Successfully Added BMW 3 Series Android Car Stereo - GPS, Hands Free, Wi-Fi, Android 6.0, 4G Support, CAN BUS, 7 Inch Display to your Shopping Cart. If you are a fan of the BMW 3 Series you can now have that great ride with fantastic audio and a stellar GPS system, all thanks to this Android car stereo with GPS. This 1 DIN car radio player offers Bluetooth support which lets you connect your mobile phone to it and play your favorite songs without any cable. Not only mobile phones, you can also use tablet computers. When you connect it to your smartphone, you will be able to use the touchscreen interface. Moreover, it will also let you answer calls and adjust music as well as convenient access your phonebook. So now you can safely use the hands-free to take calls while driving. One of the best features of this car stereo system is the Android that is the main operating system. All the features of the Android operating system will be available in your car through this car stereo system including Google Play and other apps. What is the point of having a touchscreen if it is not large? Android 6.0.1 Car Radio Player Touchscreen Bluetooth GPS Radio has a 7-inch large display that allows you to view all the details with full clarity. Furthermore, it enables you to access all the options with ease using just a few taps. These features combined with its ability to work perfectly with BMW 3 series including 2005-2012 and E90-E93. It will really add that touch of grace to your car that you seek in your vehicle. This android car stereo for the BMW 3 Series comes with 12 months warranty, brought to you by the leader in electronic devices as well as wholesale car stereos and gadgets..